The European Union is an unlovable institution. For a quick rundown of all its faults, try Larry Elliott’s analysis in the link at the end of this paragraph. However, in the current campaign/whatever you want to call it in Britain, this has almost become beside the point – what matters are the actual alternatives, yes or no, in front of us. Leftie supporters of Britain leaving the EU often talk as if they’re hoping on the sudden appearance of an alternative universe, in which a vote to leave on 23 June will be followed by the blossoming of an all-progressive UK with full control of its ‘sovereignty’, a reborn democracy ready to sail on into a future of participation and extra health spending for all. But this is not on offer, so nobody should kid themselves. What we do have is an Out campaign led by some of the most devious, opportunistic, self-seeking conservative politicians around (big-C and little-c) prepared to pump out manipulated information and complete lies (of course, no one’s allowed to say that on mainstream media, only ‘inaccuracies’) on an outrageous scale, building on the style established in all the years in which the tabloids (the Mail, Express, Murdoch papers) have used made-up stories about ‘Brussels meddling’ as a space-filler, a handy bile-outlet and an excuse for anything they don’t like in the UK. This is not any rational critique of the EU, Elliott-style: it is, as that great champion of the people John Major at last said yesterday, just dishonest. And demeaning, and destructive of any notion that leaving the EU has anything to do with ‘reclaiming democracy’. Unless your only idea of it is manipulation. Brits are habitually smug about the quality of our ‘democracy’, public life and so on, but the cheap demagoguery and dishonesty of Gove, Johnson, Gisela Stuart et al is on a scale that if we saw it in Togo or Trinidad or anywhere else out there would inevitably get journalists sighing over the primitive, corrupted level of the local political culture. They’ve developed a whole style of campaign, based on the ‘consistent counter-factual’: any and every body, institution etc that’s looked at it says that the idea that we send £350 million a week to the EU is baloney, but Boris Johnson still drives around with it written on the side of his bus… They even make a strength of their non-facts, saying anyone or anything that disagrees with them is in the pay of Brussels. And following on from the £350m, the even bigger lie is that if this (imaginary) figure was not sent to the EU, they would spend it all on the health service! This from Gove, Johnson, Duncan-Smith, all privatisers! How can anyone believe this tosh, and how come it had to be John Major (again) who pointed out how ludicrous this is? So, anyway, all of the above had been irritating me to the point where I actually felt I needed to leave all the yes-buts aside, get up off the sofa and get involved somehow. Which is how on Saturday I came to be on the ‘Another Europe is Possible’ stand on Tottenham High Road. I should say that I didn’t want to be at all sectarian about this, I’d previously offered my services to the official IN campaign, but at an event I tried to go to nobody else turned up (which perhaps says something about the relative energies of the REMAIN campaign and the manic energy of the Outers). The leftists of Another Europe were actually there, plus, they have the support of Yanis Varoufakis, who can make a plea for the EU in better English than any British politician (see http://www.anothereurope.org/votein-event-reports-photos-videos/). 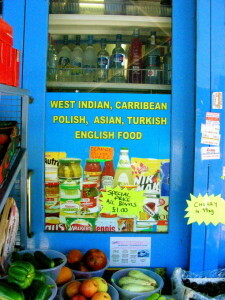 For anyone who doesn’t know, Tottenham High Road is, as they might say on the radio, ‘one of the most multi-cultural parts of this multi-cultural metropolis’. People are from all over. Standard stereotypical view of this kind of area re the EU referendum is probably that people are either a) all pro-Brexit tabloid readers or b) don’t care or c) don’t have a vote anyway because they’re all recent migrants. But, some impressions from the reality-face. Older West Indians are extremely polite and the only people who consistently thank you for uninvitedly pushing a leaflet into their hands. This makes for a civilised encounter. They’re also the most likely to stop and chat about it. Older white people are the most likely to grunt as they go by and say ‘Nah, I’m for Out’ or something similar. This is entirely in line with stereotypes. Only one of them turned out to be the classic Brexit headbanger, an old Labour man who said that all the EU did was drive down wages for the working class, and said Jeremy Corbyn was a traitor to the working man and a disgrace. There were three of us on the stand and he had a go at each of us in turn, he was so fired up with that Brexit rage. Thing is he started with his argument about wages and then segued into something about the EU being a conspiracy against working people with all sorts of tabloid-style claims about how much of our money those Brussels-ocrats are spending on themselves. At this point I felt one short surge of achievement when I managed to cut through his flow when he said the EU doesn’t even sign off its accounts, and I said yes it had for the last five years (I’d only read this the other day, since of course it’s scarcely mentioned in the same media who moaned regularly when they weren’t signed off). Then we got into the real heart of the argument, with ‘no they haven’t… yes they have… no they haven’t… yes they have…’ I offered to show him the report on my phone, but he wasn’t interested and went off on something else. I don’t know if this counts as winning a point or not. Quite a lot of younger black people, particularly women, were noticeably well informed about the Referendum and said they’d vote to stay in. This didn’t match any stereotype I’d heard of. A number of Asian people (who by stereotype are anti-EU) were pro-IN too, but less talkative about it. A Polish girl thanked me for being there but said she was afraid she didn’t have a vote. Beyond each incident, feeling you’re getting through a little and being ignored the next, I got, though, a sensation that there are two lines of argument sailing past each other, not engaging but framed in entirely different terms. There are all sorts of rational reasons for staying in the EU: simple economics, firstly – even the Leave campaign themselves have said the economy would take a hit if we left – the need to cooperate to deal with any international problem these days, the utter vagueness of the Leave campaign’s vision of what they want, the idea that internationalism is good for us. Plus the sheer irrationality of putting one’s trust in the chronic dishonesty of the Outers. And the IN campaign is, yes, overwhelmingly rational.